We don’t only farm here, we love music too. 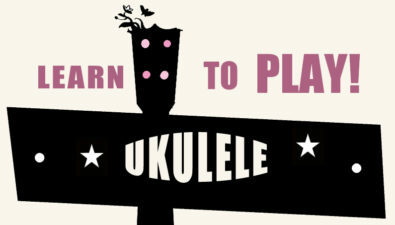 Aside from Pete and Claire running the odd music event, Claire Nicolson, partner of Peter Bourner, also teaches adults the ukulele. Claire helps run the farm and river camp is also a very talented singer/songwriter and great all round musician. Having been singing and playing all over the world for the last 20 years she likes to keep it all a bit more local these days and enjoys playing gigs in Hastings Old Town and the odd full band show and has found that she “ain’t too bad at teaching”. Sam Brown, who Claire used to sing backing vocals for all sorts of well known bands and runs The Fabulous Ukulele Club thought Claire would be good at teaching the uke too. Claire’s mother was a music teacher and sure enough it turns out that she’s great at it. She runs beginners / intermediate and advanced courses, here on the farm in our Hot House and in Hastings upstairs at The Jenny Lind. The idea is to learn 1 or 2 songs a week, and then we give a small performance for our family and friends on, or shortly after, the last session. You will also have access to an online dropbox folder where you will find all the the music we’re learning and recordings from the class to practice. 69, High St, Hastings, East Sussex, TN34 3EW. Thursdays beginners – 6.30pm – 8pm. I would prefer full payment in advance of the course, on or after the first lesson. You can either pay by transfer, paypal, cheque or cash. If you pay cash please put it in an envelope with your name on it. If you would prefer to pay weekly, i’m sure we can sort something out, please contact me. Details below. Thank you! “Claire is a very engaging and very unique person. She is an extremely talented musician and knows exactly how to fill her students’ minds with enthusiasm and courage – albeit we are at different levels of knowledge and accomplishment.. Somehow Claire has the gift of being able to pull us all together – playing and singing ukulele songs we never thought we’d be able to – with a lot of fun and laughter on the way. I personally I cannot recommend her classes more highly. I have been attending now for nearly a year and it’s changed my life – is the highlight of my week” – Fiona Sandilands.